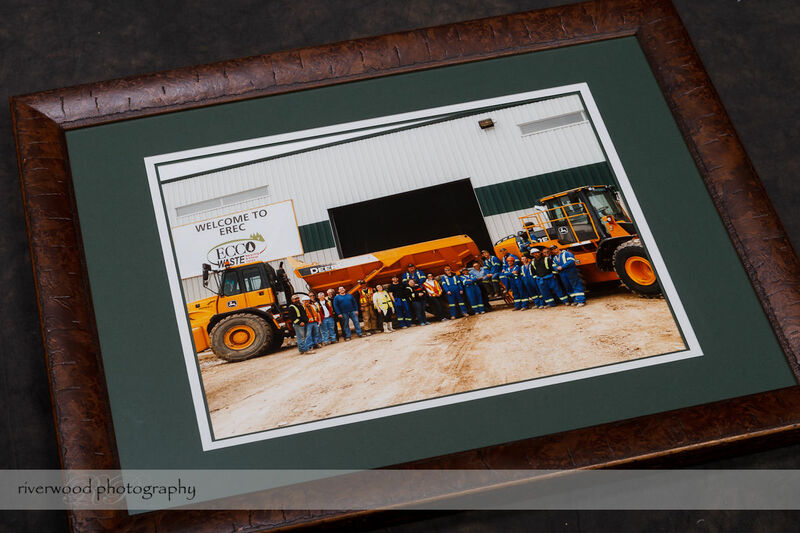 This is an example of a completely custom frame built to order for one of my Calgary Commercial Photography clients by Karen at Time Frames Custom Framing. I have been working with Karen for almost 2 years now and we have an arrangement where Karen provides a couple of specialty frame options that are always available to my clients. These are hand-made custom frames, but they have been standardized and there are only a couple of sizes and options available at list prices. Occasionally one of my clients wants something a little (or a lot) different than the standard frames that are always available. In that case I refer them directly to Karen and she always has great ideas on how to create the piece the client has in mind. In this specific case the client knew the style of frame and the color of the mat that he wanted to use for an industrial photograph that I had shot previously. He met with Karen to review the options available and between them they agreed on what the final product should look like. I provided the printed photograph in the exact size required and Karen put it all together. The photo above shows the resulting frame that Karen created. I’m extremely impressed by the result and it really looks great. As with all the other frames from Timeframes this product included a hand-made molding, a custom-cut mat, and Reflection Control UV Inhibiting Glass. It is an extremely high quality product and I’m very happy with it! This is a great example of something that can be used at a commercial or industrial site to show off the people or products at the site. It can also be used, as this one will, as a gift to an employee that is moving on due to retirement or location transfer. If you would like to learn more about commercial, industrial, or portrait photography in the Calgary area please contact Sean at 403-615-3708.